Life has been busy the last several weeks. 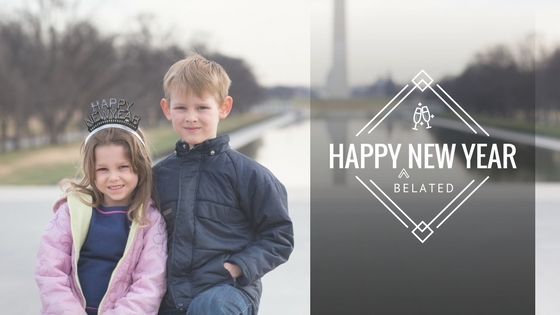 With the holidays, the New Year, vacation, and just life in general, we have definitely kept very busy here in DC. I’m grateful to say that I have been feeling well and that my energy level is back to normal, if not better levels than pre-surgery. I am still working on a couple of hurdles in my recovery in regards to range of motion and pain in my pectoral muscles, but with time I am optimistic that these things will heal as well. Although the surgery and recovery process did not go as I expected, I still think the outcome was worth it. Today’s post is more about getting back on the horse after a good amount of time not writing, and playing a bit of catch-up. I have sat down to write this post many times, but I get caught up in my to do list and it never gets done. I also recently got talked into co-chairing a HUGE auction for my children’s school in DC, which is proving to be a full time job and then some. The past month and a half has been a bit of a whirlwind. We celebrated our first Christmas in another state, which came with its own challenges, but also its own rewards. It was hard to be away from family during the holiday. I haven’t felt homesick all that often since I moved, just random days where I am triggered by some sort of event. The holidays stirred up a lot more feelings of homesickness. But if I’m really honest, I think it was less about missing “home” and more that I didn’t feel like we had a choice. My husband had extremely limited time off and it was quite expensive to get tickets back to Florida. I had even looked up flights home to surprise my parents on Christmas morning, but the cost was excessive! Even if we could have traveled, we would have been torn between our two families since they reside in different states. In addition, staying in town meant that the responsibility of Christmas fell largely, if not solely, on me. I put a lot of pressure on myself to have a wonderful Christmas. I was feeling a lot of guilt that the kids couldn’t be with their Grandparents and cousins for the holiday and focused my anxiety on finding the “perfect” gifts for my kids (even finding myself in East Baltimore after a wild goosechase for Ellie’s dream toy). This spurred even more anxiety as I battled the dichotomy between my desire to find the perfect gift and my current efforts to declutter and minimalize. I wasn’t sure what to do for our holiday food either. My kids kept talking about the “holiday feast” that they were imaging, but as we are eating mostly plant-based foods, I did not even know where to start. I felt overwhelmed and unsure. To make life a little bit easier, I suggested that we have Christmas Eve dinner out at a restaurant and pick up our “main entrees” for Christmas dinner at Whole Foods and that I would take care of the sides. My husband and kids picked out cheese lasagna and I opted for tofu “chicken” and I completed these meals with roasted brussel sprouts, cranberry sauce, and gluten free stuffing. In the end, Christmas turned out to be quite delightful. 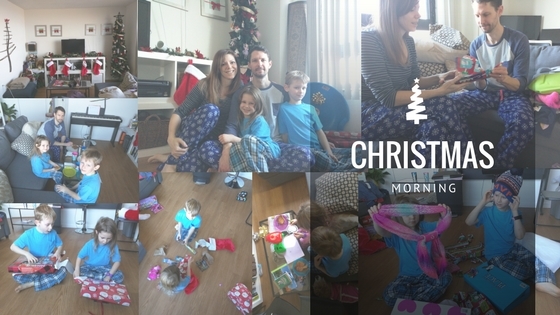 We really tried to be present on Christmas morning, balancing the opening of Christmas gifts with an overall gratitude for our general life gifts. We discussed our blessings and what the holidays were all about. Even though we couldn’t be with our extended family, we were really enjoying the time we had – just the four of us. After Christmas, we made a last-minute decision to take a small vacation. 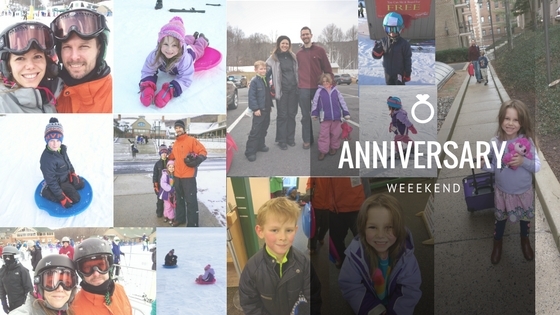 We couldn’t figure out what we wanted to do for our 9 year Wedding Anniversary that weekend since the one babysitter we have found in DC was away for the holidays, so we decided to drive an hour and a half north into Pennsylvania to go skiing. We went to a small resort called Whitetail and used hotel points to decrease the cost of our adventure. We were also able to take advantage of a lot of great deals for first-timers at this mountain and it really paid off! The mountain was not very busy and our group lessons turned into private lessons because they had so few people signed up as compared to the number of instructors that they had on for that weekend. The weekend trip to the mountains really increased the value of living in DC. We have talked about moving out to Colorado for the past couple of years, but are conflicted because the travel back and forth to our family would be more challenging in both cost and time. Being able to get to a mountain, albeit much smaller, in only an hour and a half really changed our view of living on the East Coast. We had an amazing trip – probably one of the best vacations we’ve had, and left with fond memories! On the way home from Pennsylvania, we started discussing the option of staying in the DC area. We talked about benefits and compromises we would have to make. When we arrived home we took several day trips around DC and the surrounding Virginia area to start looking at areas where we may be able to see ourselves living. We got excited about the prospect of having a home again. Although there are a lot of benefits of renting, I definitely feel a strong pull to plant roots. I find this difficult as a renter. It is a new feeling and I’m trying to wrap my head and heart around it. 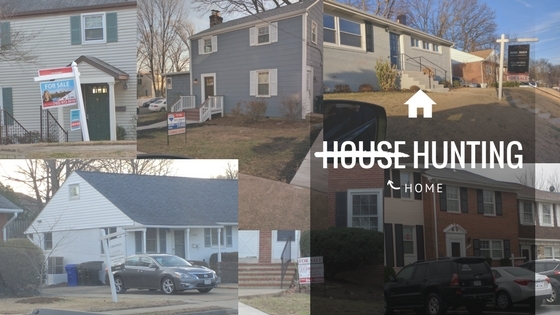 Looking for a property in the DC area is such a different experience than looking for a home in Florida. The prices of the homes are astronomical. For what we purchased our 2,200 square foot home, with A+ schools, swimming pool, two car garage, and backyard, we can afford a 1 bedroom/1 bath apartment in our current neighborhood. If we want to remain in the good school zones the prices are pretty comparable across the district – and in some cases even go up! Then there is the challenge of finding a property that allows dogs. We started looking in Northern Virginia as well. Areas such as Burke, Alexandria, Springfield, Falls Church, Vienna…to name a few. The problem is, that although this increases the square footage some, the prices are still exorbitant. Unless you are willing to increase your commute significantly the prices stay relatively high – especially as compared to where we came from in Florida. The search for a home has left us questioning so much about what we want and need. Weighing the pros and cons of a house vs a condo and a commute vs walkability. We have only begun our search and we may end up simply renting for another year – only time will tell. 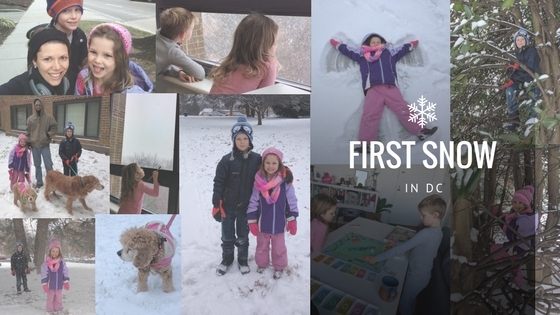 Another exciting experience that we have had in the last few weeks is that we received our first snowfall since living in DC. We had a couple flutters earlier in the week, but nothing that stuck. Two weeks ago, we had actual snow! REAL SNOW!!! We watched it come down from our window and waited till there was enough on the ground to play in. The kids layered up with all their winter clothes on and headed downstairs with the dogs. We spent a good hour playing in the snow. The kids loved it. And so did I. We are having a mild winter thus far – with only one snowy weekend. I feel silly that I was ever worried because I really love it. It is so amazing to have seasons. I went my entire life not understanding seasons and what they meant. Living in Florida we really only have one temperature – hot and I am not racing back any time soon, despite being away from family and friends. Lol.